At the Polish Oracle Users Group (POUG) conference this week I'm presenting one of my favourite talks, [Still] No Silver Bullets - OBIEE Performance in the Real World. This presentation is based on the shared experiences of myself and my Rittman Mead colleagues helping our clients diagnose and - most importantly! - fix their OBIEE performance problems. Performance is something that's interested me for a long time, and my very first conference presentation back in 2010 was on how to test OBIEE performance. Since then I've written and collected a lot of material on the subject, which I thought would be useful to present here as a handy one-stop reference. This series of blog posts goes into great detail on the specifics of testing, and diagnosing, OBIEE performance. Topics such as how to define an "OBIEE report" are covered in depth, along with a discussion of the tools available to carry out performance testing of OBIEE and monitor the results. There's also a whole post on optimisation (frequently called 'tuning') and a hefty rant against some of the common anti-patterns that we see adopted when it comes to troubleshooting poor performance. If you ever encounter the unqualified advice "To fix your OBIEE performance problems, enable BI Server caching", then run! BI Server caching can be brilliant for providing the "icing on the cake" of a well-built system, giving that extra little performance boost. Where BI Server caching is a bad idea is when it is used to "paper over the cracks" of a fundamentally poorly-built OBIEE system. If the foundations are rotten, gold-plating the building on top is not going to do anything to improve things in the long run. If your OBIEE performance is bad, you need to get to the bottom of why and then rectify it. Using caching to mask it only "brushes the problem under the carpet", storing up the same problem or worse for the future as your system usage increases. As presented previously at OOW, OUGF, UKOUG, OUG Scotland, and POUG. Newly updated for OBIEE 12c. This article has been published on Oracle Technical Network (OTN), and examines in detail what happens when there's sub-optimal design in the implementation of an OBIEE system. Disks fill up, IO bandwidth is exhausted, the server is overworked - and performance suffers. The Rittman Mead Performance Analytics Service is the result of our deep understanding of the OBIEE stack, performance optimisation theory, and numerous client engagements. We understand why performance is so crucial to the success of an OBIEE project. We know how OBIEE works, how to diagnose performance issues -- and how to fix them! Our Performance Analytics Service offers a free baseline Performance Analytics Report for your current OBIEE system, using data to demonstrate where your performance issues lie and prioritising the areas in which to focus investigation. Building on this baseline report, we also offer a detailed Performance Analytics Report. 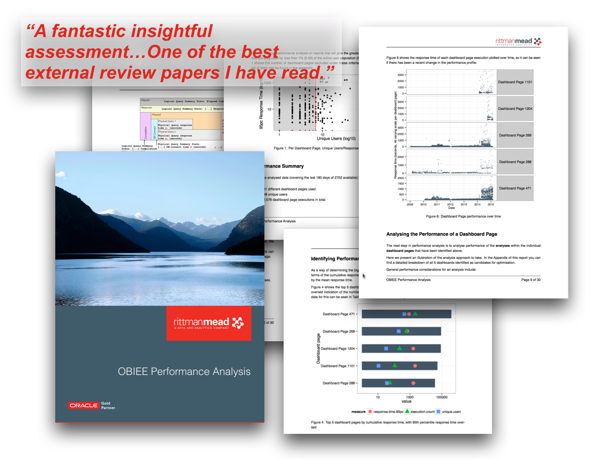 This is prepared by one of our expert OBIEE performance consultants based on deep analysis and understanding of your specific OBIEE implementation and performance pain-points. Not only do we diagnose the specific issues, but we demonstrate the relative effort involved to rectify each one and the expected performance benefit that each will yield. To provide powerful monitoring and diagnostics for the performance of your system we built the OBIEE Performance Analytics Dashboards. These give a full-stack view of the metrics that can impact performance of your OBIEE reports. This gives you the information needed to accurately diagnose issues when they arise, as well as perform historical analysis. Have a look at these videos to see exactly how the dashboards can help, and get in touch with us to request a demo! Oracle has published white papers available through My Oracle Support that detail further options available within the OBIEE stack for tuning performance. In a blog article I do somewhat grumble about these papers and how they can be misused ("oooh here's a knob that I can fiddle with") if taken without proper context and diagnostics. In the right hands, however, they are useful reference for some of the more advanced configuration settings and their impact on performance. OBIEE Performance is nothing particularly fancy. The problems are the same as any other stack; just different components. The standard principles apply, and that is why I'd strongly recommend reading these articles as they give a fantastic background to the world of performance diagnostics and optimisation. Oracle Data Integrator 12c: Getting Started - What is ODI?